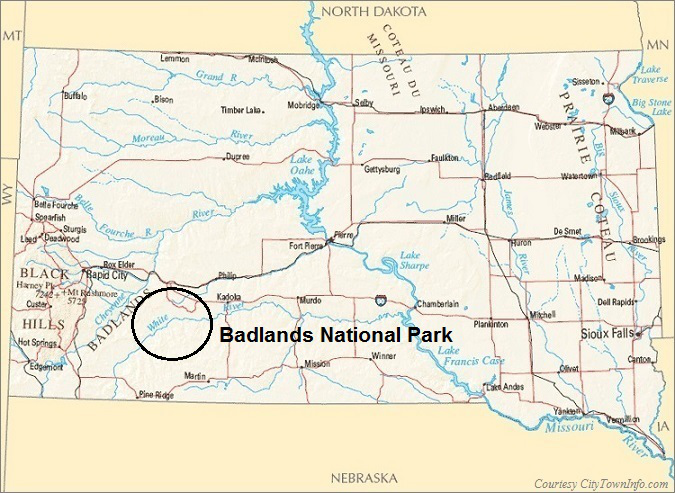 Badlands National Park in the Black Hills of South Dakota is home to badlands that are known by Native Americans by the name of "Mako Sica", which means "land bad". 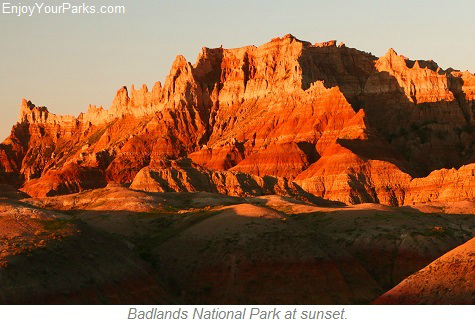 This incredible park is a bizarre showcase of erosional processes that have revealed many layers of ancient sedimentary rock, each having their own amazing color such as yellow, red, purple, orange, white, tan and gray. Wind and Water have ravaged this land, making it a visual spectacle that will leave you amazed and thrilled. And surrounding these strange and beautiful rock structures as a result of millions of years of erosion, lies the largest undisturbed mixed grass prairie land in America. And beyond this vast protected mixed grass prairie land lies the extensive Buffalo Gap National Grassland. With all this and more, two words can describe this wondrous place, which would be "beautiful desolation". 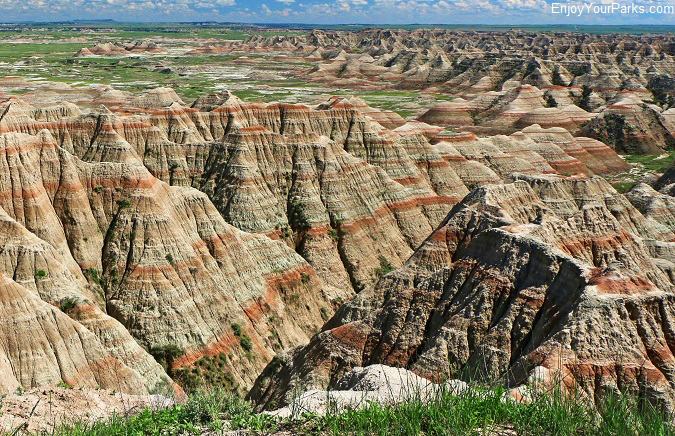 Badlands National Park of South Dakota. the Oligocene Epoch of the Age of Mammals where 33 million year old fossilized skeletons of ancient three-toed horses, saber-toothed cats, camels and huge rhinoceros-like animals are among the fossils found in this unique and special place. 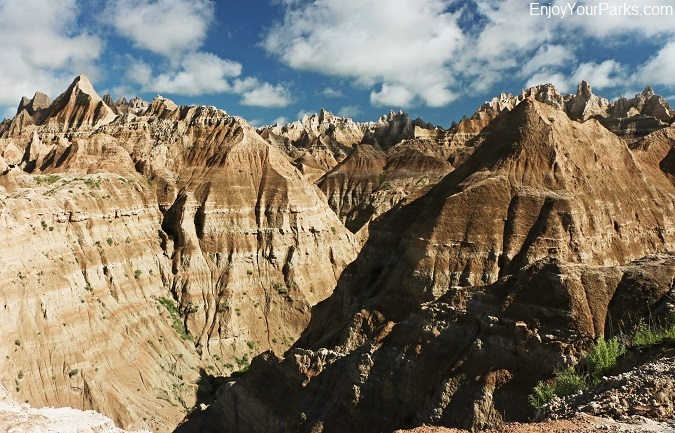 Each year more and more amazing fossils are discovered at Badlands National Park, each telling its story of an ancient past. As visitors drive through the Badlands National Park, they have the exciting opportunity to see pronghorns, bison (buffalo), mule deer, whitetail deer, coyotes, prairie dogs, snakes, turtles, eagles, hawks, vultures just to name a few... and of course the nearly extinct Black-Footed Ferret, which were re-introduced into the area in 1994, and are at this time the most endangered land mammal in North America... But don't get your hopes up to see a Black-Footed Ferret because they are nocturnal animals and rarely seen by visitors. 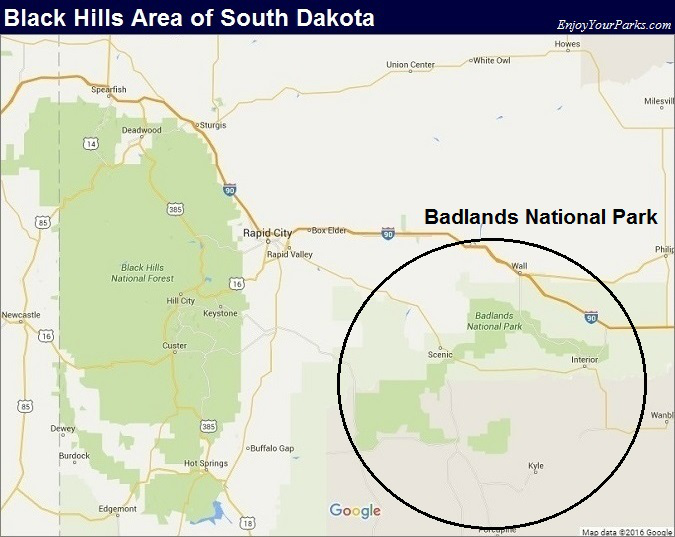 The Badlands Wilderness, which includes 64,144 acres of Badlands National Park, is a designated wilderness area where the Black-Footed Ferrets were successfully reintroduced in 1994, and is essentially undisturbed by man. 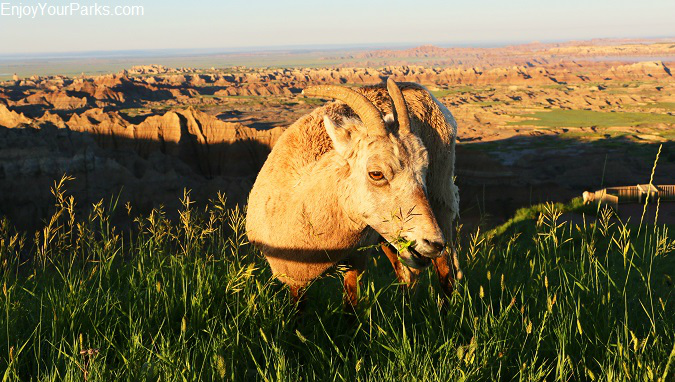 Bighorn sheep at Badlands National Park in South Dakota. Palmer Creek Unit (see map). Each unit provides its own unique landscape and history, and all are very much worth exploring. 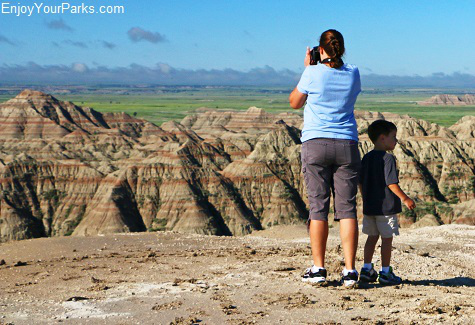 The most visited unit is the North Unit due to the Badlands Loop Road, which provides phenomenal scenery and wildlife viewing. 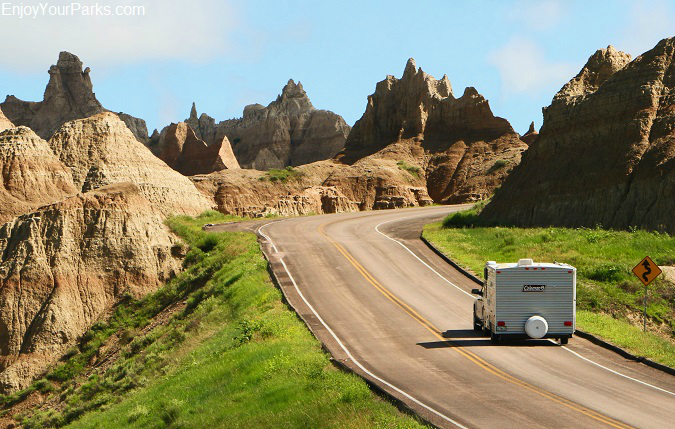 Also known as The Badlands Loop State Scenic Byway, the Badlands Loop Road is a 30 mile loop of South Dakota 240 between the towns of Wall and Cactus Flat, which over 30 scenic overlooks make this drive one of the most scenic drives in America. 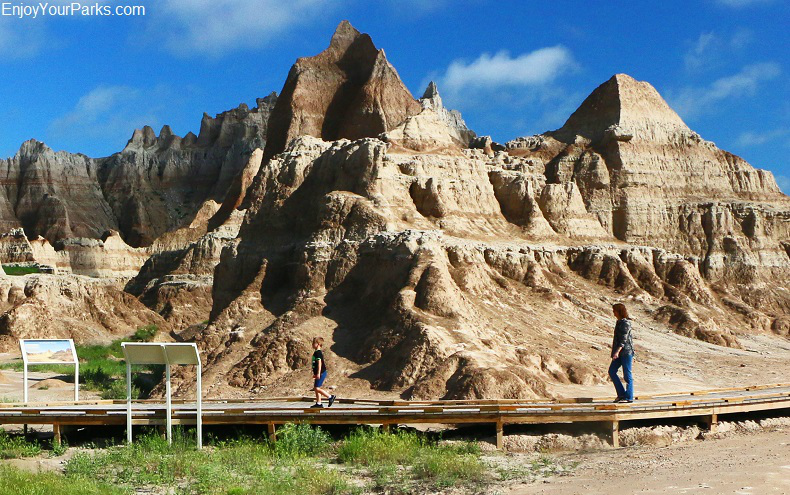 The Ben Reifel Visitor Center is located on the southeastern tip of the Badlands Loop Road, and is an excellent place to learn all about this fantastic wonderland. 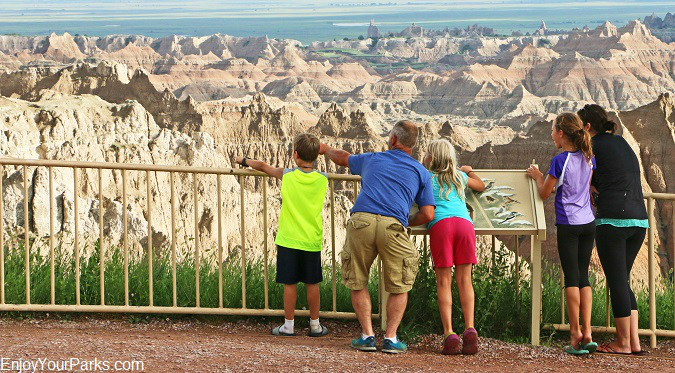 Visitors enjoying the amazing view at Badlands National Park in South Dakota. 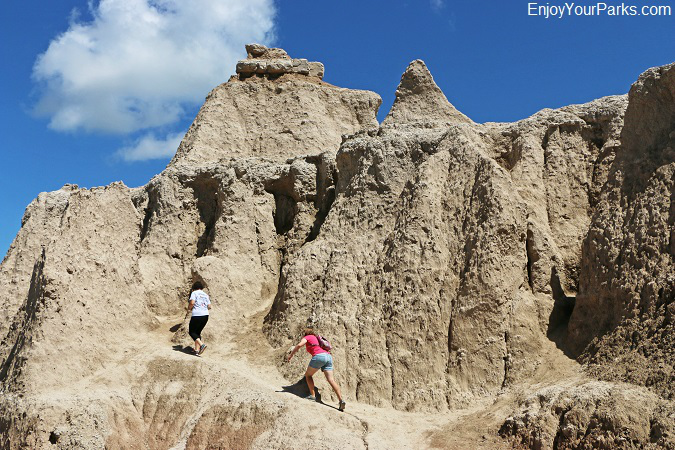 There are several trails found throughout Badlands National Park, ranging from the short and easy quarter mile trail known as "Window Trail", to the more advanced and longer trails such as the ten mile long "Castle Trail". 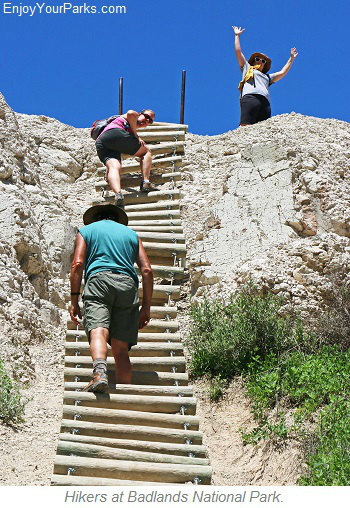 Many of these trails take you to incredibly scenic vistas. 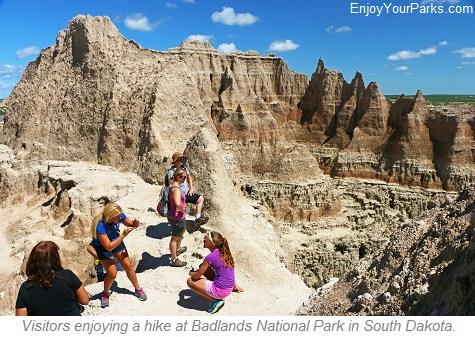 Hikers enjoying Badlands National Park in South Dakota. Service. 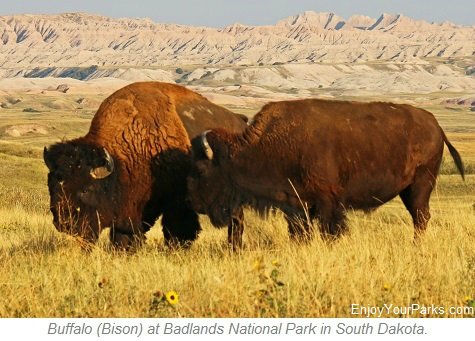 Both located located in the southern area of Badlands National Park, not only is there incredible scenery, but the South Unit is extremely rich in Native American history. This 133,300 acre area holds the stories of the earliest plains hunters of over 11,000 years ago, known as paleo-Indians, all the way up the present day Lakota Nation. The Stronghold Unit was once home to what were known as "Ghost Dances". These ghost dances, along with their Ghost Shirts, would allow the bearers of these shirts to be impervious to bullets. Their Indian prophet Wovoka led thousands of Indians to the area to perform these Ghost Dances after having a vision where the white man would vanish and their hunting grounds would once again be renewed with game. The last known Ghost Dance was held on Stronghold Table in the South Unit, and the events that followed ended eventually at the Wounded Knee Massacre. 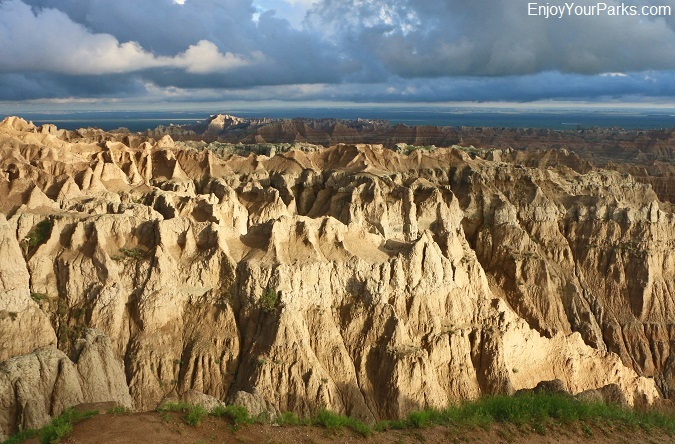 Located in the Stronghold Unit are what is called the White River Badlands, which is where the richest deposits of 33 million year old Oligocene mammal fossils are found. Scientists from all around the world have come to this special place for the past 100 years, where they learned an infinite amount about this time in the earth's history, and it provided them a clear glimpse at life during the Oligocene Epoch like no other place on earth. Located at the most southeastern tip of the Stronghold Unit is the White River Visitor Center, where visitors can learn an incredible amount about this history-rich area. 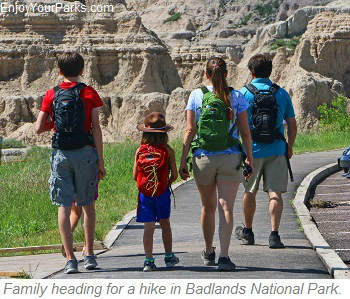 There are two designated campgrounds located at Badlands National Park as well as numerous back country campsites along some of the longer trails. 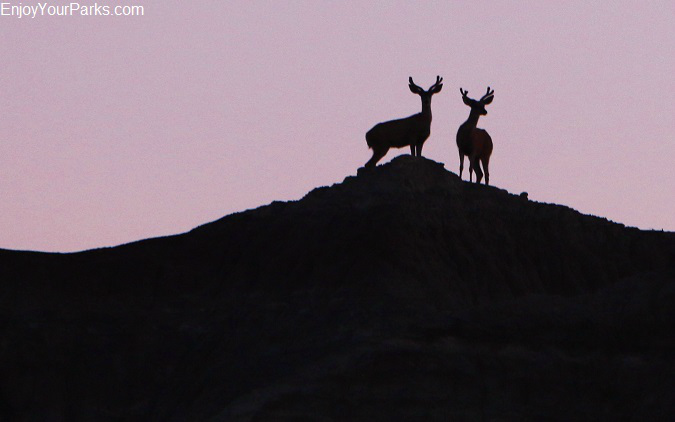 Mule deer on the evening skyline at Badlands National Park in South Dakota.